After a 7 hour train journey from Prague, we pulled into the main station in Budapest, eager to get to our hotel. So off we went in search of a taxi. Word of warning; only use taxis with a running meter in Budapest (Uber doesn’t work there) who don’t quote you a flat fare in Euro. One dodgy taxi waiting outside the train station offered to bring us into the city for €28. However, the one we hailed on the side of the road only cost 2000 Hungarian Forint, which is less than €7. Both cars look like regular yellow cabs, but never go with the drivers who approach you. Hail or call instead. About 15 minutes later and we were being greeted at the Aria Hotel Budapest. The five star hotel, easily earns its rating. I think the two major differences between 4 and 5 to me, personally, are the staff and attention to detail. Aria exceeded in both! 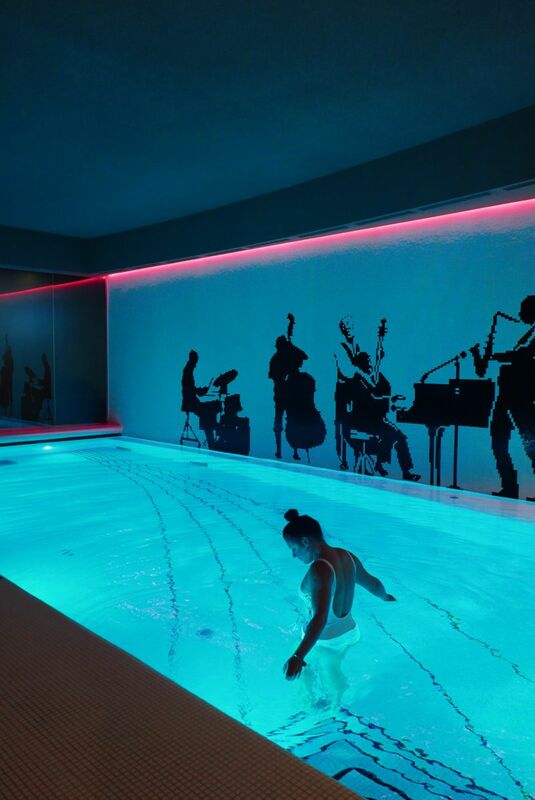 The whole hotel has a musical theme and is separated into four wings; classical, jazz, opera and contemporary, which is where our Bob Dylan room was. We were lucky, because the lift right outside our door went directly up to the High Note Sky Bar and all the way down to the spa…easy access to the best bits! Our room faced into the central courtyard area with access to our own private balcony and the sound system was wired into the plush marble bathroom (take note other hotels, mirrors should always be heated!). 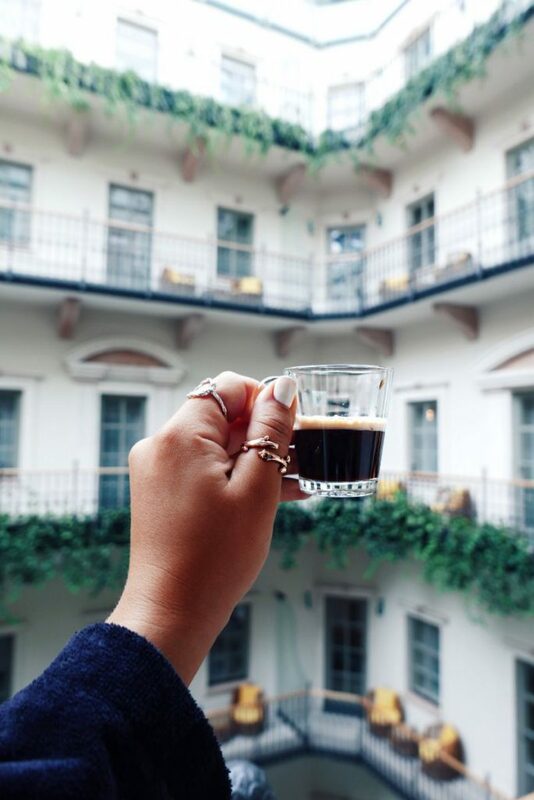 So I was able to get my morning BBC Radio One fix in the shower followed by coffee from the Nespresso machine on the terrace. The Aria has a complimentary cheese & wine reception in the central music garden lobby every day from 4-6pm. It’s just for guests of the hotel and is accompanied by different live music every day. If you saw my Snapchat or Instagram story you’ll have heard the amazing singer and pianist perform Sia’s ‘Chandelier’ and ‘All of me’, by John Legend. 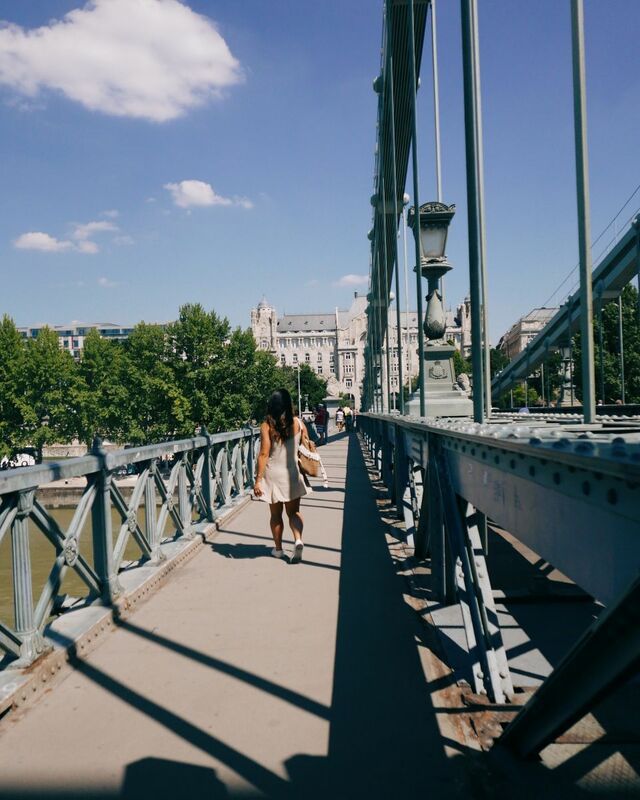 We hadn’t been out to explore Budapest yet, but the next day appreciated this downtime even more because it was so chilled out and relaxed in comparison to the tourist hustle and bustle. 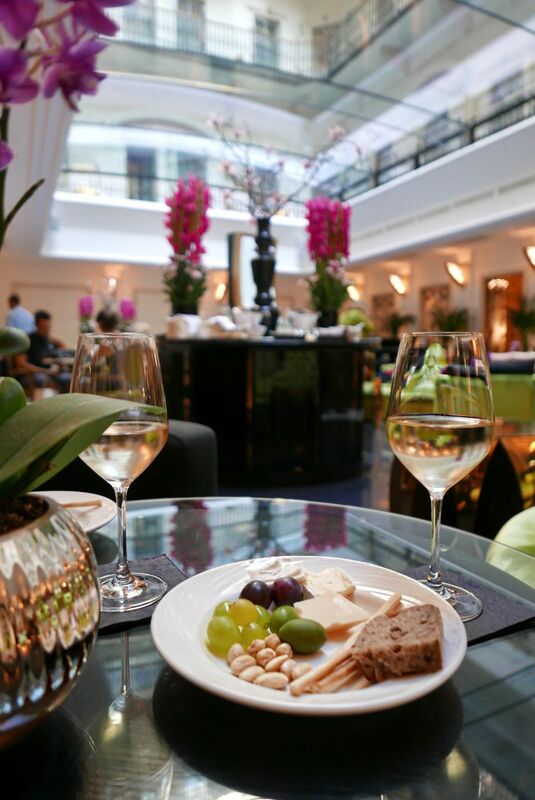 At about five-to-six, after countless wine top ups and second and third helpings of cheese, nuts, bread and fruit, we noticed the waiter carry the cheese platter away. Neither of us could manage another sliver of Brie, but Courtney said, “what if I wanted more?” just as the server crossed paths with another who was bringing a fresh display from the kitchen to the counter. That shut us up, as did the last over generous pouring of wine at 6 on the dot! I’m a die hard sunset fan and if there’s an opportunity for unobstructed views with a gin & tonic in hand, I’m there. So we took the lift to the top. 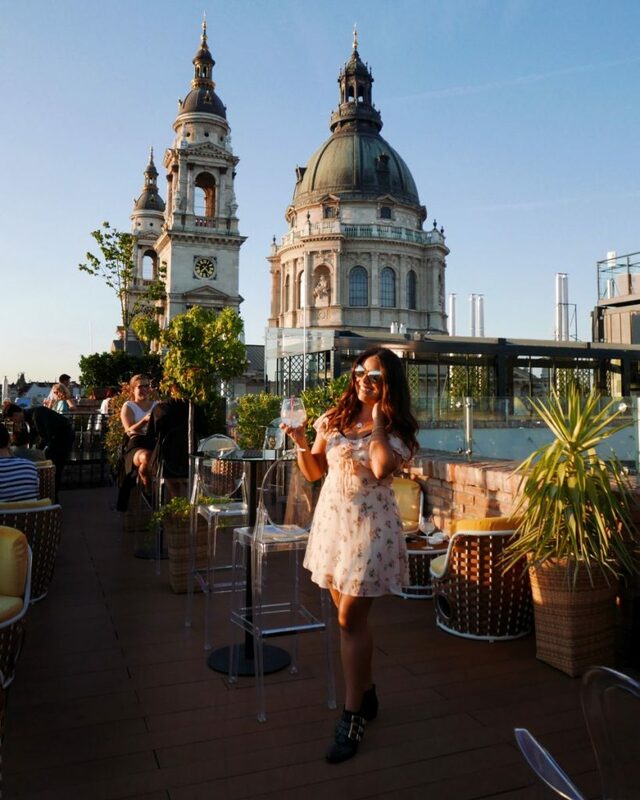 The Aria hotel’s roof bar has 360 views over Budapest and is directly beside the dome and towers of St. Stephen’s Basillica. G&Ts ordered, I set about getting snap happy and counting down until the sun dipped out of sight. You’d want rather large pockets to continue drinking there, but it’s definitely worth it for one or two. Budapest is famous for its ruin bars, so after strolling around not finding a whole lot of nightlife open yet and not hungry for dinner after all the cheese, we jumped in a cab to Szimpla Kert. It’s the biggest and most popular ruin bar in Budapest, so top of our list. As the taxi approached, the narrow Kazinczy Street was lined with hipsters and tourists in town for Sziget. Lanes and alleyways to the left and right all crammed with people, outdoor bars and street food and then a massive queue for Szimpla. It dissipated fairly quickly though, as the bouncers asked for ID and teens chancing their luck were refused at the door. The place is a labyrinth of indoor and outdoor rooms over two floors. With an eclectic collection of bric-a-brac, themed bars and a crowd made up of a dozen different languages, Szimpla was certainly a feast for the senses! I think I’d rather do this place during the day though. Go early and have a proper wander ’round in daylight before it gets too busy. Grab some food and a good spot in the courtyard and just chill for a couple of hours. From a night out in ruin bars to the most decadent of room service breakfasts in fluffy robes, I do love a good contrast. I also loved the fact that I didn’t have to decide what I wanted the night before and leave my order outside the door before a certain time. Instead, I browsed the menu on the iPad Air Aria supply in their rooms, then called to order. The picture says it all really, and doesn’t even include the cooked to order omelette. Well, they say breakfast is the most important meal of the day don’t they? Set up for a day of exploring, we walked across the Chain Bridge before buying a Big Bus Tour ticket which included a free river cruise. Annoyingly, the times have been updated since they printed their leaflets that have the maps and timetables. So we rushed to make a ferry that didn’t exist and had to wait an hour. Obviously we used the time to find a bar then had a major row with the crew who didn’t want to let us bring our own drinks on, instead buying their overpriced ones. Probably wouldn’t recommend that company! 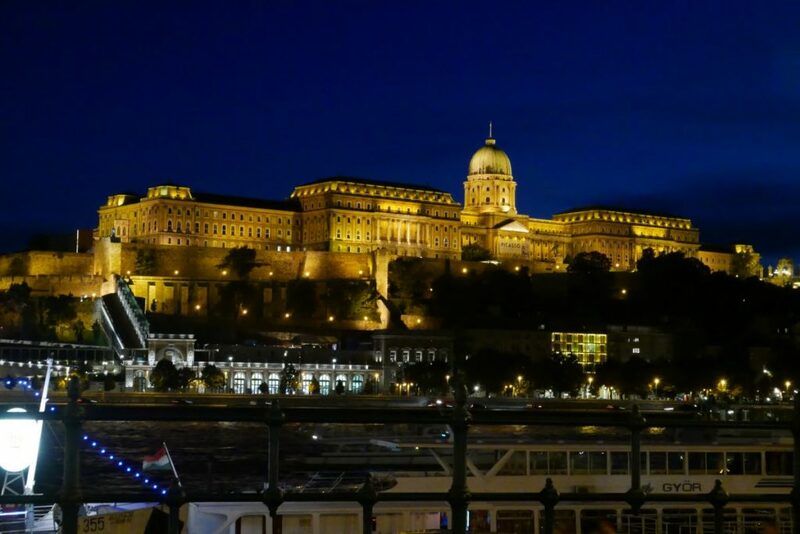 Do try get out on the Danube after dark to see Buda and Pest all lit up. 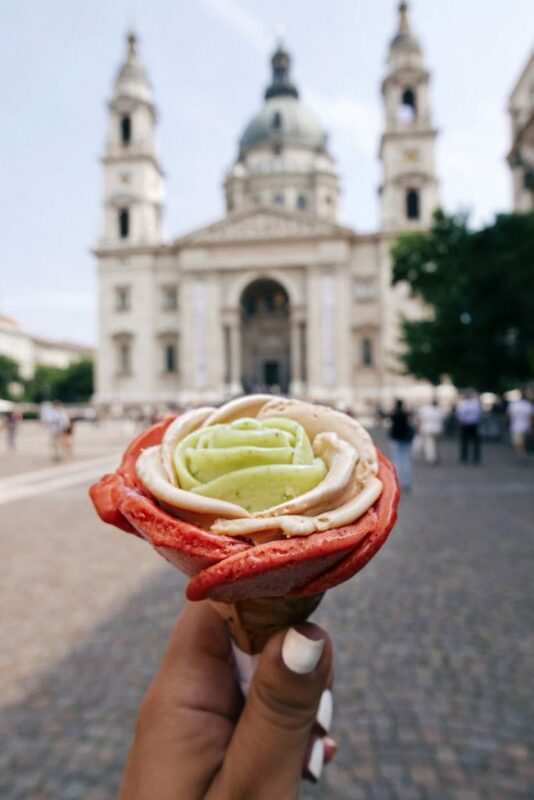 And don’t leave the city without trying sorbet shaped into flower petals, because if for nothing else, it makes for great photo op. Back at the Aria, I had just enough time for a quick dip in the pool and I managed to pick the perfect time because I had the place to myself. During high season! I could’ve spent hours jumping between the sauna, steam room and jacuzzi, or the whole day on one of their poolside cabanas. But I suppose it’ll have to wait until next time. Not ready to leave, but with a flight to catch, I skipped public transport in favour of Aria’s fancy car service. They give preferential rates and it means you don’t have to pay the driver in cash (they add it on to your bill before checking out). €37 to the airport in a pretty luxury car right to the door (the street is pedestrianised) was a no brainer and the perfect end to my stay in Budapest! Thanks to the Aria Hotel Budapest for our stay. 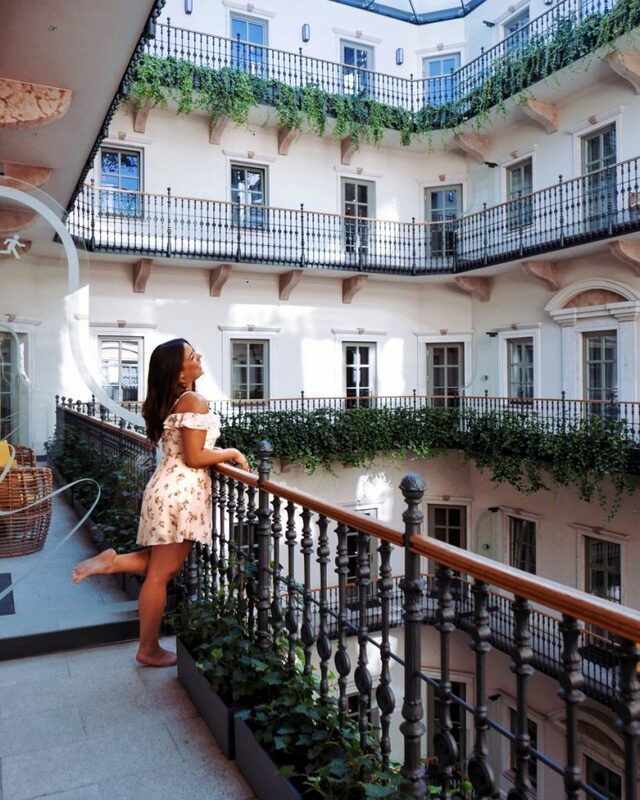 See www.AriaHotelBudapest.com for more info and check our their Instagram here. 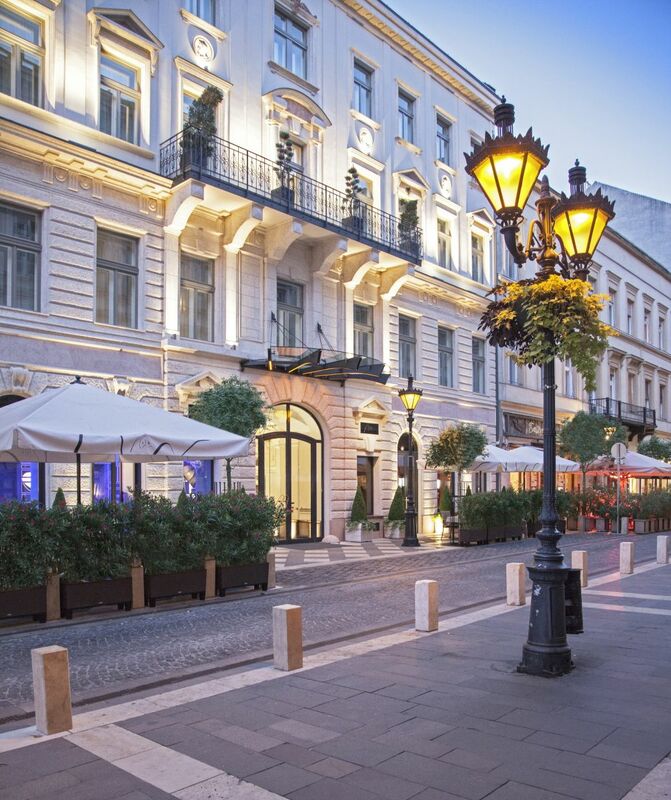 Email Stay@AriaHotelBudapest.com or phone: +36.1.455.4055 for reservations.